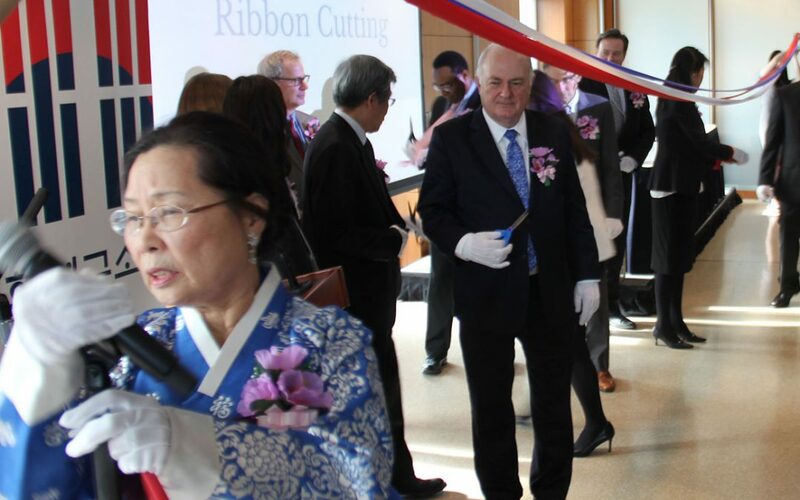 WASHINGTON — George Washington University inaugurated a program that will expand Korean language and cultural studies at the institution on Thursday, part of an expanded program funded by the South Korean government, officials said. The university established a new Institute for Korean Studies after receiving a grant from the Academy for Korean Studies, a division of the South Korean Ministry of Education. The grant expands the university’s existing Korean language minor into an academic major and host a lecture series. The grant will also help the school establish a newly endowed professorship. University officials said the Korean Studies institute is one of the few such programs in the country, and the first in the Washington-D.C. area. Ahn Ho-Young, South Korea’s ambassador, to the United States said that the grant was intended to promote cultural understanding. “Maybe… we can have stronger relations on [a] global partnership on the basis of a stronger partnership in the humanities,” Ahn said at the inaugural event. Douglas B. Shaw, the university’s senior associate provost for international strategy, said that cultural understanding would enhance economic and diplomatic relations. “Future American leaders will need Korean friends,” Shaw said. University officials said the institute was a good fit because of the school’s historical connection to Korea. Steven Knapp, the president of George Washington, said that South Korea is the largest source of international students at the university and that the country maintains the largest alumni group outside the United States. The Korean language has been taught at GW for more than three decades, and the program has steadily grown over that time, officials said. Kim Seong-Kon, president of the Korean Literature Translation Institute, spoke said that American students are expressing increased interest in Korean culture. “Thirty-eight years ago, when I was studying in the United States, at that time I saw American students put up posters of The Beatles or Che Guevara,” said Kim Seong-Kon. “Today I notice that they put up posters of Psy and Girls’ Generation,” popular South Korean K-pop artists. Jisoo M. Kim, the newly named director of the Korea institute, said the university competed with a number of academic institutions in the United States and internationally to win the grant. “We were very fortunate that we were able to get it this time,” said Jisoo Kim. The school and the South Korean government did not specify the amount of the five-year grant. Jisoo Kim said she hopes the institute will reach beyond academia. The Washington, D.C. area is home to a roughly 100,000 Korean-Americans. “Our aim is not just to develop scholarship of Korean studies and curriculum for our students, but also reach out to communities, especially professionals and policymakers,” said Jisoo Kim.